Our latest 1.28mm DEEP BLACK Poly Arrives! Not long after it was launch in 2017, our G-TOUR3 polyester has gained a solid reputation in the tennis industry. - A new color Deep Black to contrast and complement Solid Yellow. * Tested by Gosen Co., Ltd.
Providing the joy of winning to a lot of players. Tennis is a competition, and it is also a battle against yourself. The quality of your play changes dramatically depending on the condition of your mind. However, if you find a reliable tennis gut, the quality of your play will be stabilized and you will be closer to victory. GOSEN is in pursuit of a good feeling at impact to secure the victory. GOSEN attaches importance to a positive feeling upon impact. Players often use sensual expressions, such as “a good/bad feeling at hitting,” “a light/heavy feeling at impact,” and “feeling easy/difficult to hit,” for the impact of hitting the ball. How should we satisfy players? 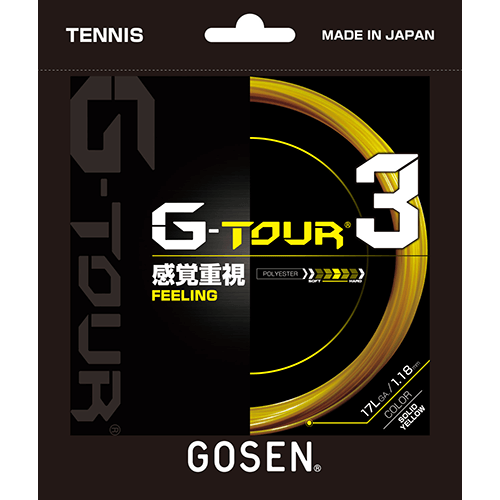 GOSEN, in pursuit of a good feeling at impact with all-round polyester gut, has developed the G-TOUR3 to win the trust of a large number of players. The “striking shot x initial speed” is one of the answers GOSEN has drawn in pursuit of “feeling” which is preferred by many players. The reliability of the tennis gut at the time of impact is ensured by two conflicting factors: a good feeling from catching the ball, and optimal resilience obtained from the initial speed. The improved reliability will enable you to play more aggressively and positively to get points that you have not been able to get. To continue playing more aggressively and positively is a shortcut to victory. The "striking shot x initial speed" is one of the answers GOSEN has drawn in pursuit of “feeling” which is preferred by many players. Challenging to reduce the gauge to ensure a good feeling. 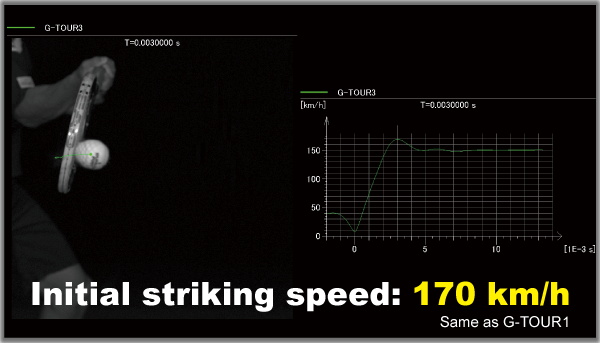 GOSEN has drawn the answer that a reliable feeling is produced by a good feeling at striking and the initial speed, and chosen the reduction of the gauge thickness to realize the reliability of tennis gut. 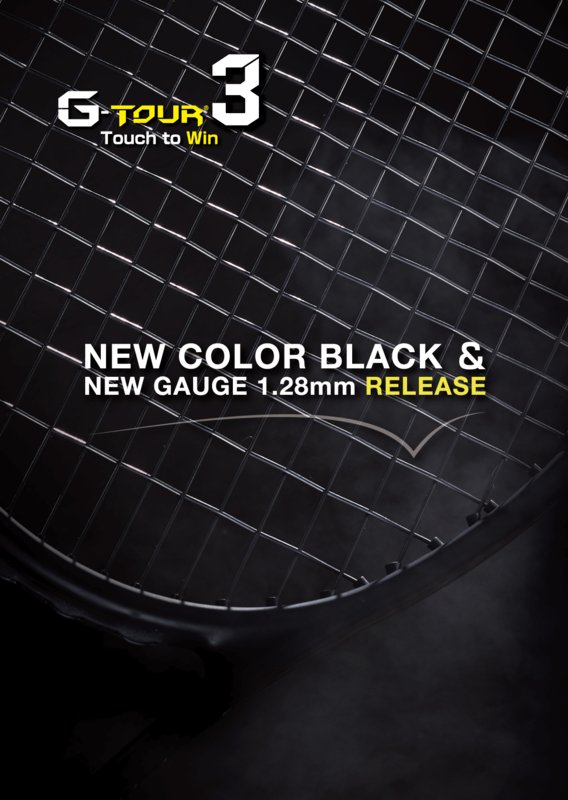 The G-TOUR3 is available with two gauges—1.23 mm and 1.18 mm in thickness. Although a thickness of 1.25 mm is a trend, GOSEN has decided to make it more resilient by reducing the thickness by 0.02 mm. A decrease in the thickness usually involves the reduction of a good feeling at striking and the degradation of the durability of the gut. 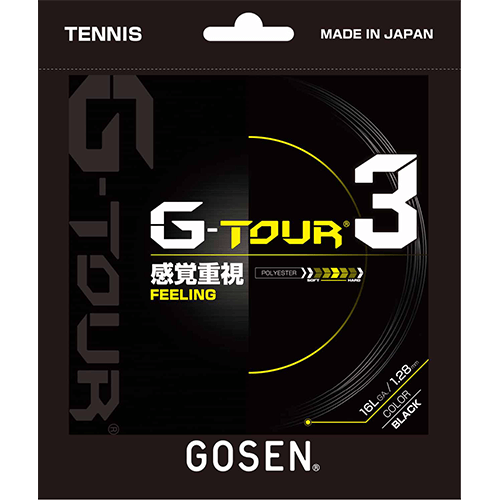 GOSEN has succeeded in solving the problem with the G-TOUR3. What has solved these problems? With the development of the G-TOUR1, GOSEN improved its polyester development technology. GOSEN has further improved the component formulation and the designing of high-performance polyester (HPP) in pursuit of providing a satisfactory feeling on impact to every player. 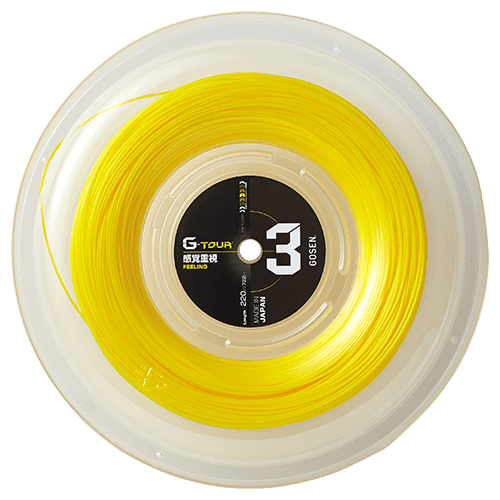 As a result, GOSEN has succeeded in developing stiff but flexible polyester gut that ensures a good feeling at catching and striking the ball. Compared with the G-TOUR1, the G-TOUR3 does not require the player to hit the ball hard. At the same time, a thin gauge of soft HPP boasts high durability and an excellent rate of tension retention. The unique formulation has realized high durability with a thinner gauge. 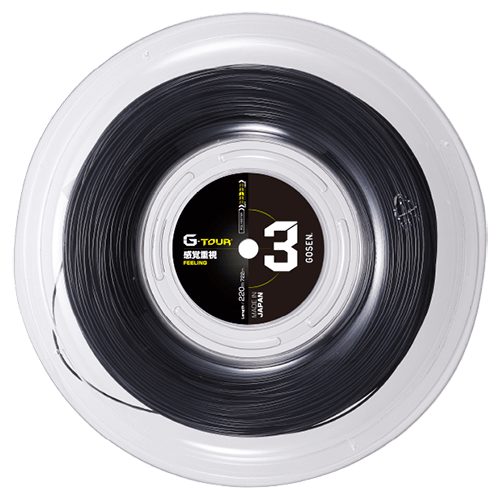 The G-TOUR3 maintains high-tension performance that could not be realized with conventional soft polyester gut. 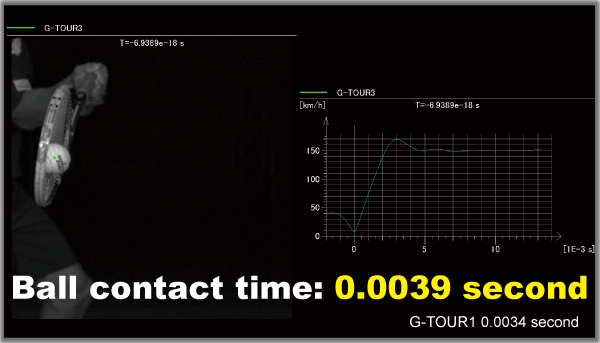 The G-TOUR3 exhibits the same tension maintenance performance as G-TOUR1.